Getting close to breeding grounds! Over the past week, our two Whimbrels ‘KS’ and ‘KU’ have made significant progress towards their breeding grounds. In one or two weeks’ time we should also hopefully be able to find out where they nest, which is one of the main objectives of this satellite tracking project. Another very interesting question is: Will ‘KS’ and ‘KU’ reunite again at the breeding grounds? We are also now quite certain that ‘JX‘ will stay in Palawan, the Philippines. 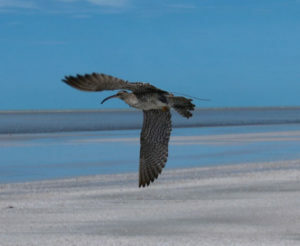 Nevertheless, it is still giving us valuable information as north-west Australia leg-flagged Whimbrels have not been resighted in South-East Asia before. Follow the link through to update 4 of the 2017 AWSG satellite transmitter project to read the latest on the progress of the tagged Whimbrel!